The new XYRIS 6 is the ideal everyday all round drone designed specifically for easy and effective single or two-person operation. The XYRIS 6 is great for aerial photography and video shooting, and it can be easily equipped with special measuring tools for terain mapping, thermography and precision agriculture. The drone uses GPS assisted flight for easy operation and is also capable of fully autonomous flight. 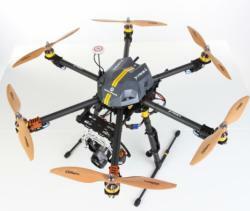 It is designed to carry advanced stabilized camera gimbal, everything in compact size along with folding arms. This READY TO FLY hexacopter comes assembled by our professional highly experience technicians, fully tested and ready to fly out the box with the everything you need! Váš dotaz k produktu "Dron XYRIS 6"